Are you having trouble getting started on something? Maybe you are good at starting, but you give up on stuff before you’ve given it a fair chance? Get started using habit sprints. Starting anything, let alone starting a business, is tough. Ever wonder why? It’s because of fear, lack of planning and the inertia of the learning curve. From my personal experience, there are three common obstacles that prevent people from getting started. When something’s new to you, it’s honestly tough to know where to start. I’ve learned the best way to start something is to pick one action and to do it over and over again. If I’m going to make a commitment of my time and energy, my brain keeps nagging me about whether or not the payoff is going to be worth it! Here’s the truth, you won’t know, until you try. Anytime you do something for the first time it’s going to be hard. The perfectionist in you is also going to be hard on yourself for not getting better at it faster. It’s hard because you’ve never done it before. Most likely it won’t be fun, but sometimes it is. Give it a chance. Most of us resist starting because we focus on the achievement of others, when we should be focusing on starting our own habit. A habit sprint is a commitment to one habit over a specified period of time. 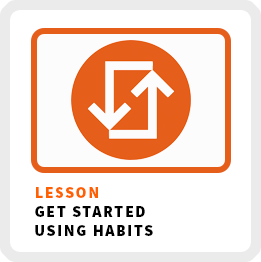 If you ever want to learn anything, you’ve got to turn it into a habit first. If you want to get better at anything, you have to build a foundation of habits. Here are four different type of habit sprints you can try. There are 30-day, 90-Day and 100-day challenges all over the web and for good reason. They give your brain permission to commit to trying a new habit without knowing the outcome because there is a deadline in sight. 30-day challenges are great for busting through the learning curve inertia. They give you the focus you need to power through the challenges of learning something new. A member of my Accelerator committed to posting a short video on YouTube each day for 30 days to document his entrepreneurial journey. One reason he’s doing it is to just to learn what happens when he does try to do one action over and over again for 30 days. Here’s his latest video on Day 20. 30-Day Challenges are also great for experimenting with a new habit or changing an old one. I recently gave up sugar for 30 days just to see how I would feel. The first week was tough, but as my addiction to sugar grew weaker and weaker with each passing week. It reminded me that I did have the resolve to take on other unproductive habits in my life! A variation on the 30-day challenge is the mastery sprint. If you want to focus on getting better at something, do it over and over again within a set period of time. It liberates you from worrying about “making mistakes” by focusing on taking action. Other podcasters thought I was crazy! I told them, I will improve faster doing a daily podcast versus a weekly podcast. Why take 20 weeks to improve, when I can do it in one month and bust through the inertia of my learning curve? If you are having trouble getting your most important work done, schedule it! Turn your most important work into a habit. My most important habit is writing and I do it for a minimum of 2 hours each morning! Better yet, schedule your most important work during your peak performance period. Sometimes you keep talking about something you really want to do, but never do it. Maybe you are waiting for the perfect set of circumstances to arrive, but they rarely do! As my mother would say, “it’s time to take a crap or get off the pot.” Meaning, either do it already or stop talking about it! I’ve been talking about writing a book about the future of work for the past couple of years, but still haven’t done it. I told my mastermind group in January that if I don’t publish my book by the end of this year, not only will I never talk about it again, but I will never think of it again! By the way, if you want updates about progress on my book you can sign up here. So what have you been having trouble getting started that you could turn into a habit sprint?